Shake Rattle & Roll Pianos is getting some JERSEY LOVE! Many thanks to our pals at the Englewood Daily Voice, for welcoming our New Jersey office! An artist known for never standing still – David Bowie passed away yesterday peacefully after an 18-month battle with cancer. A singer, songwriter, multi-instrumentalist, record producer, arranger, painter, and actor. Bowie has been a figure in popular music for over four decades, and is known as an innovator, particularly for his work in the 1970s. But his body of work continues into 2016 – his newest single BLACKSTAR releasing this month. Shifting through various identities throughout his career, Bowie was at times known as Ziggy Stardust, Aladdin Sane, the Thin White Duke, the Man Who Fell to Earth, and other personae. Expanding his career beyond music, he was most recently involved with LAZARUS, a new musical adaptation of THE MAN WHO FELL TO EARTH, currently running at the New York Theater Workshop. Shake Rattle & Roll is GigMasters’ 2015 Rising Star Winner! Third Year in a Row! 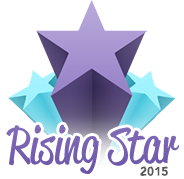 Our good friends at GigMasters have just awarded Shake Rattle & Roll Pianos the Rising Star Award for our third year in a row! That means, that in the ENTIRE USA, no other piano entertainment company had more customers in 2015 than Shake Rattle & Roll Dueling Pianos. We’re looking forward to an even BIGGER 2016! 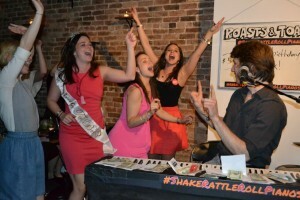 Dueling Pianos Video of the Week – New Year’s Eve!!! From our ROCKIN’ New Year’s Eve show, Dec. 31st at The Cellar @ 22 Warren St., NYC, we ring in 2016 with our SOLD OUT crowd singing Auld Lang Syne!!! One of the league of seemingly indestructible aging rockers, Lemmy Kilminster died earlier today. The bassist and Motorhead front-man died of an extremely aggressive cancer, which was just reported only two days ago. Plagued by various health issues over the past few years, the hard-living, hard-rocking Lemmy made no secret about his alcohol and drug use. He famously claimed he had consumed a bottle of Jack Daniel’s every day since turning 30. “Apparently I am still indestructible,” he quipped, in a 2014 interview, saying that only death would keep him from performing. To date, Motörhead have released twenty studio albums and achieved 30 million in sales worldwide. From our SOLDOUT Saturday Night show Dec. 26th at The Cellar @ 22 Warren St., NYC, Zach and Mark played a little 20-finger piano on GREAT BALLS OF FIRE!! !